RIT assistant professor and alumnus Rui Li joined the world’s best artificial intelligence experts to present a new machine learning algorithm at NeurIPS 2018, the largest AI conference, Dec. 5 in Montreal. Researchers at Rochester Institute of Technology are sharing their work amongst the world’s top artificial intelligence experts this week at NeurIPS 2018, the premier AI conference. The RIT team designed and implemented an algorithm that allows AI to analyze high-dimensional data sets more efficiently. A paper on the RIT work, called “Sparse Covariance Modeling in High Dimensions with Gaussian Processes,” was accepted for the Conference on Neural Information Processing Systems (NeurIPS), where academics and industry share work that pushes the boundaries of what is possible in AI. Rui Li, an assistant professor of computing and information sciences at RIT, was invited to give a spotlight presentation at the conference Dec. 5 in Montreal. 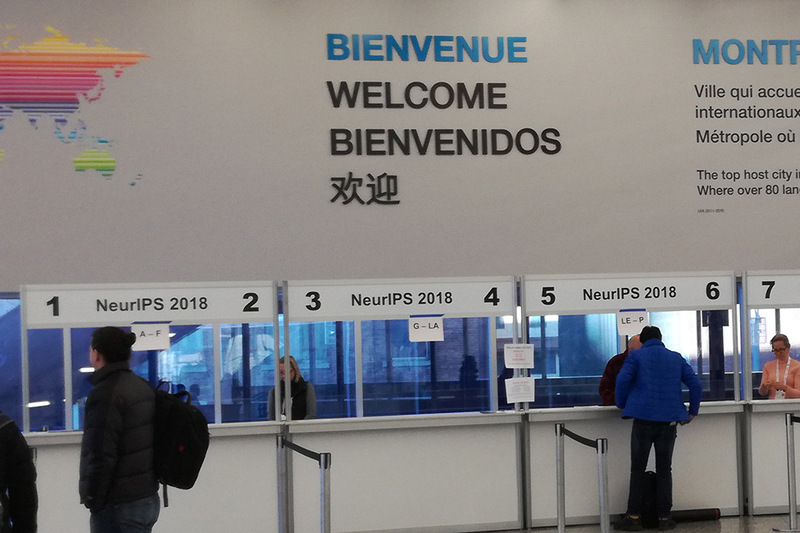 NeurIPS is the longest-running and largest artificial intelligence gathering for scientists and industry, with nearly 9,000 attendees this year. In fact, the first batch of 2,000 tickets for the conference sold out in less than 12 minutes. The RIT research, led by Li, seeks to maintain a balance between speed and accuracy when a computer is working to analyze high-dimensional data sets. The new algorithm essentially helps to condense the number of dimensions while keeping the information statistically accurate. For artificial intelligence to work, a computer must quickly analyze data with thousands of variables. This is what allows AI to find statistical relationships in data that a human never could. However, even for high-powered computers, these immense calculations can be time and energy consuming. For the study, the team designed and implemented an efficient inference algorithm for tractable computation. The work has applications in computational biology, where it can help find statistical relationships in thousands of genes over different experimental conditions. Another example of its use is crime occurrence correlations between spatially disjoint regions that evolve over time. “By capturing the spatio-temporal variations, we can provide key information to predict crime occurrence over time and among regions,” said Li. Li presented the work along with other top AI researchers in academia and industry. The conference also includes talks and demonstrations from tech giants, including Amazon, Apple and Google. Other members of the RIT research team include Kishan KC, a computing and information sciences Ph.D. student; Feng Cui, graduate director of RIT’s bioinformatics program and an associate professor; and Anne Haake, dean of RIT’s Golisano College of Computing and Information Sciences. The work was supported by the National Science Foundation (NSF) and National Institutes of Health (NIH). To learn more about the research, read the paper.